Medial shin splints is a condition wherein the periosteum of the tibia is damaged when it is pulled away by an overstressed tibialis posterior. Anterior shin splints is a condition wherein the blood flow is obstructed from the anterior compartment due to the hypertrophy of the overstressed tibialis anterior. Medial Shin Splints: Patients complain of a dull, aching pain felt along the medial side of the tibia. Once it starts, any activity will aggravate it. Anterior Shin Splints: Patients complain of dull, aching pain felt along the anterior side of the tibia. This can be a medical emergency due to lack of blood flow leading to neurosis and gangrene of muscle in the anterior compartment. Medial Shin Splints: The tibialis posterior is an anti-pronator due to its insertion on the medial aspect of the foot. 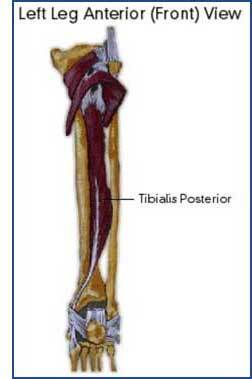 During over-pronation, the tendon of the tibialis posterior is stretched and pulled upon excessively thereby attacking the weakest area, namely its origin on the periosteum of the tibia. Small pain fibres of the periosteum are torn which causes the pain and chronic inflammation. Anterior Shin Splints: The tibialis anterior is an anti-pronator due to its insertion on the medial aspect of the foot. During over-pronation, the tibialis anterior has to fire constantly to oppose the over-pronation thus causing hypertrophy (swelling) of the tibialis anterior. Due to the fact that the anterior compartment is tightly constricted, the swollen tibialis anterior can cause an obstruction of blood flow which, in turn, can cause severe pain due to ischemia (lack of oxygen). This can be very serious and may require emergency surgery. Example of Ischemia = Angina. Medial and Anterior Shin Splints: Since the problem is the over-pronation, the patient should be fitted with orthotics and will likely experience relief as there is a high rate of success with orthotics.